Every lady should have a lovely handkerchief in her handbag. 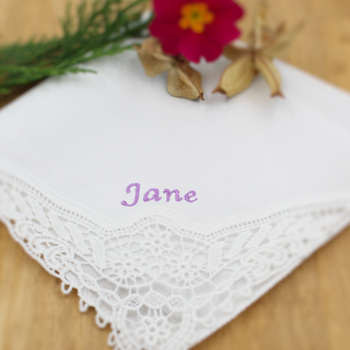 A single smooth white cotton handkerchief crochet lace to one corner (great as an anniversary or wedding hanky too!). You can select from the options for one single hanky or a gift set of three handkerchiefs. Please allow about 1-2 days for personalised orders to be dispatched as they are customised to order by Amys Gifts.